Scientists, physicians and clinical researchers in the We Care India partner nephrology hospitals bring new treatments to patients through clinical trials. Learn about advanced Nephrology treatment hospitals in India with highly experienced Nephrology doctors and employing world’s latest technologies. Nephrology Treatment provided at a low cost in Indian hospitals. Know more about the cost guide for Nephrology treatment in India. In anatomy, the kidneys are bean-shaped excretory organs in vertebrates. Part of the urinary system, the kidneys filter wastes (such as urea) from the blood and excrete them, along with water, as urine. The medical field that studies the kidneys and diseases of the kidney is called Nephrology. In humans, the kidneys are located in the posterior part of the abdomen. There is one on each side of the spine; the right kidney sits just below the liver, the left below the diaphragm and adjacent to the spleen. 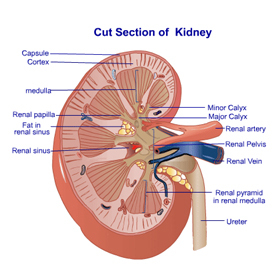 Above each kidney is an adrenal gland (also called the suprarenal gland). The asymmetry within the abdominal cavity caused by the liver results in the right kidney being slightly lower than the left one. The kidneys are retroperitoneal, which means they lie behind the peritoneum, the lining of the abdominal cavity. They are approximately at the vertebral level T12 to L3. The upper parts of the kidneys are partially protected by the eleventh and twelfth ribs, and each whole kidney is surrounded by two layers of fat (the perirenal and pararenal fat) which help to cushion it. Congenital absence of one or both kidneys, known as unilateral or bilateral renal agenesis occurs. In very rare cases, it is possible to have developed three or even four kidneys.